Scott Keogh will become the first American to hold the German automaker's top job in North America in 25 years. Scott Keogh will become CEO of Volkswagen Group's North American operations on Nov. 1, giving a VW Canada CEO Daniel Weissland a new colleague south of the border. Keogh, 49, will succeed Hinrich Woebcken, 58, a former BMW executive who took over in April 2016 amid VW's diesel emissions scandal. When Keogh becomes CEO, he will be the first American to hold the German automaker's top job in North America in 25 years. Keogh has steered Audi to 107 straight months of U.S. sales gains. Now, he’ll work closely with both Canadian and Mexican VW officials. In 2016, Volkswagen established what it calls the North American Region (NAR) “in order to take advantage of the synergies available within each of the three markets, Canada, the United States and Mexico,” VW Canada spokesman Thomas Tetzlaff said. While Volkswagen Canada operates independently, it does report to VW’s world headquarters in Germany through the North American Region. So, Wiessland will now report to Keogh, who is also head of the NAR. Keogh will be succeeded as president of Audi of America on Dec. 1 by Mark Del Rosso, 54. Del Rosso transferred to run VW's Bentley unit in North America in 2017 after nine years as COO of Audi, where he was Keogh's top lieutenant. A successor for Del Rosso at Bentley has not been named. Woebcken, who has sought greater independence from VW's headquarters in Wolfsburg, Germany, will remain "available to the company in the North American region as senior executive strategy adviser," the automaker said in a statement. Herbert Diess, CEO of Volkswagen Group, credited Woebcken with restoring confidence in the Volkswagen brand in North America after emissions violations, and said Keogh can help the brand achieve its lofty long-term sales goals in North America. Woebcken and Keogh were Automotive News All-Stars in 2017. "Hinrich J. Woebcken has brought the Volkswagen brand back on track for success in the U.S. and the North American Region. Considering the challenging conditions these achievements deserve my dedicated recognition," Diess said in a statement. 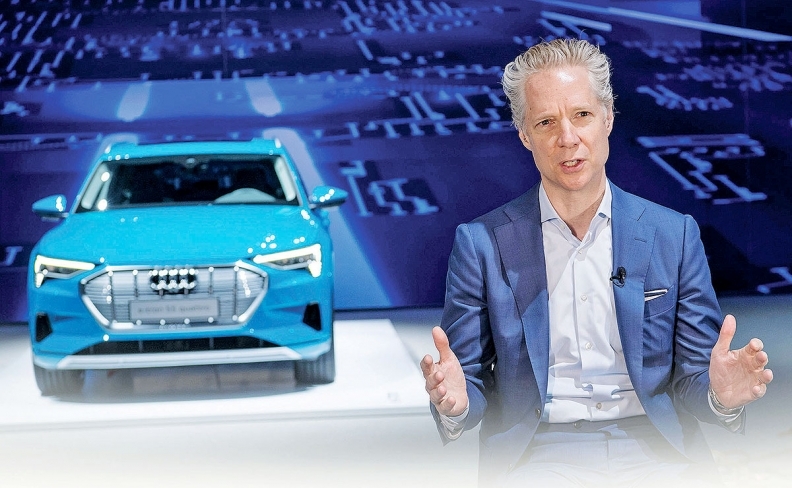 "After the successful comeback of the Volkswagen brand Scott Keogh, who led Audi to excellence in the U.S., will build upon the momentum and implement the next stage in the growth strategy as we continue to develop Volkswagen into a more relevant player in North America." Audi has the U.S. industry's longest string of year-over-year monthly sales gains at 107 months. The brand last recorded a monthly sales decline in October 2009. In 2017, Audi totaled U.S. sales of 226,511 vehicles, an increase of 7.8 percent from the previous year. This year through September, the brand's U.S. sales are up another 4 percent from a year earlier to 167,420. The last American to lead Volkswgen's U.S. operations was John Kerr, who left amid turmoil in late 1993.